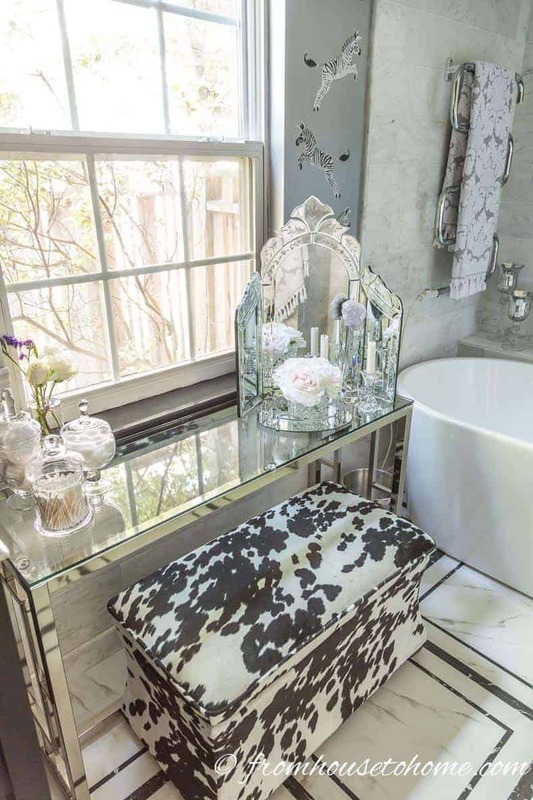 If you are looking for bathroom redecorating ideas, this eclectic, deco, glam master bathroom makeover will provide lots of inspiration and product sources. Week 6 of the One Room Challenge is here, and I can’t believe I got it done…well, mostly done…) After all those weeks of tiling, my master bathroom actually looks like a bathroom again! To remind you, this is what the bathroom looked like when I started. 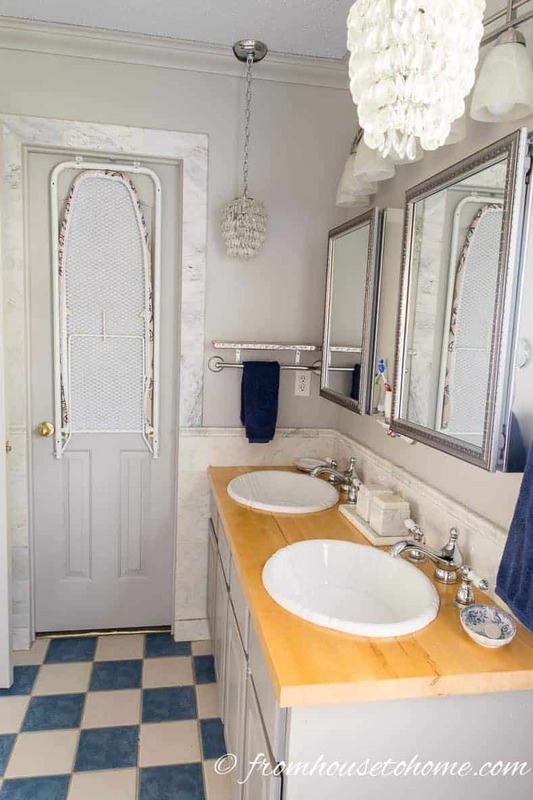 It was a partly-done makeover where I had painted the walls gray and added some marble tile but didn’t change out the original blue floor tiles or any of the fixtures (in other words, I left all the hard stuff the way it was). So this time I decided to bite the bullet and start over from scratch. 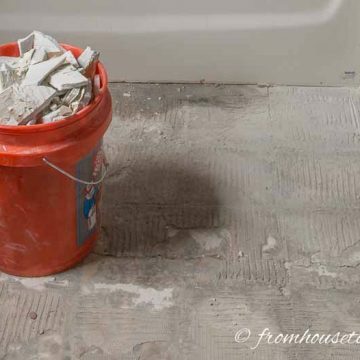 Okay, if I’m being honest, I was forced to bite the bullet by a leak which required the tub to be removed…which in turn caused some of the tiles to be taken up. And since I had to fix the tiles anyway, I decided to go for the whole she-bang. You can get more of the before pictures (and the details of my leak story) in week 1 of the bathroom makeover HERE. 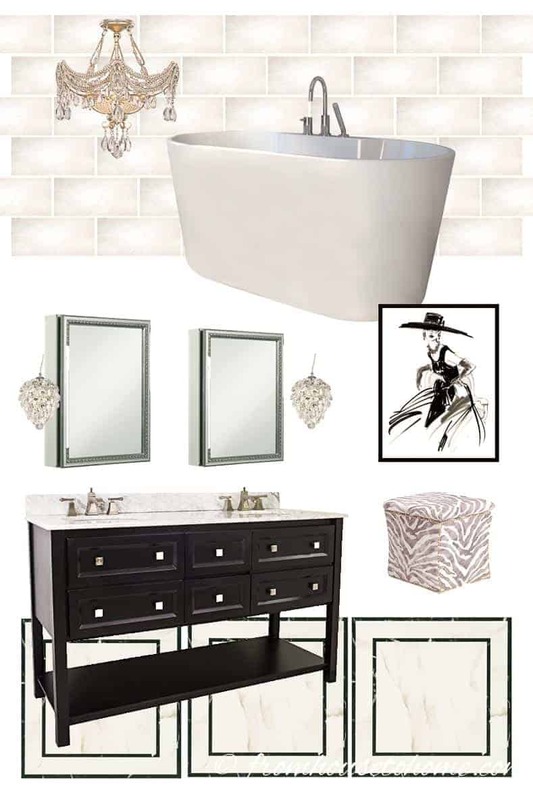 This was the mood board I came up with for my eclectic, deco, glam master bathroom (now there’s a style for you). 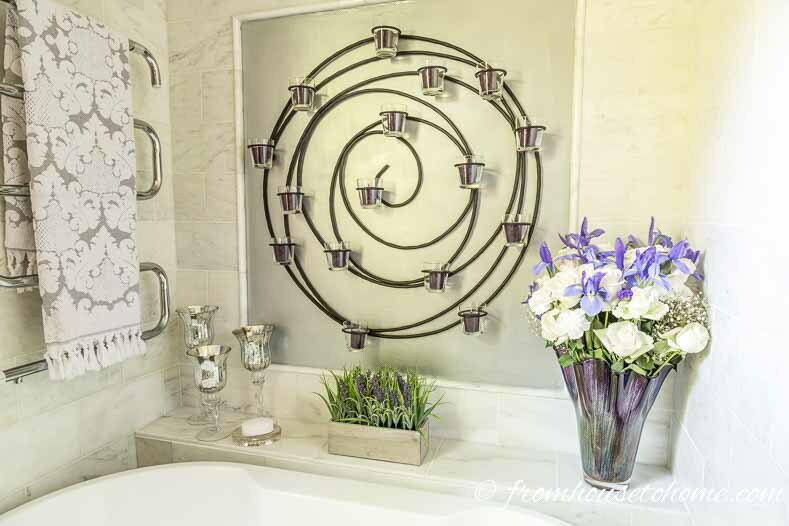 You can read more about my master bathroom design in week 2’s post. As usual for me, I came up with a fairly major design change half way through the project. 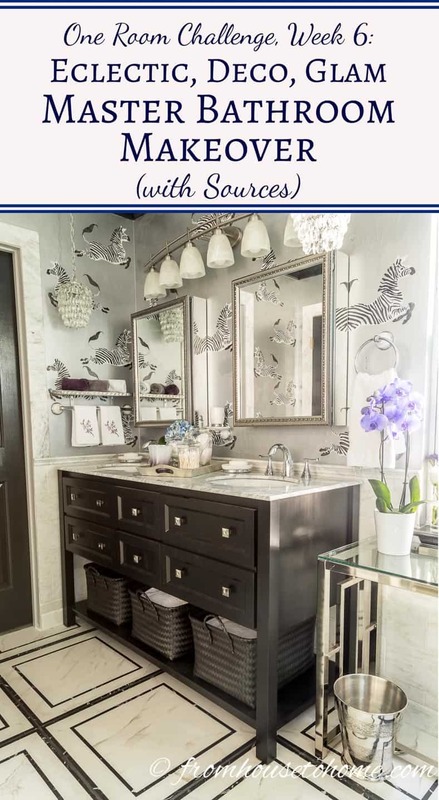 I fell in love with this zebra wallpaper from Scalamandre, but couldn’t justify the price for my builder grade home…so decided to do a DIY version of it by painting the walls silver and adding a zebra stencil. 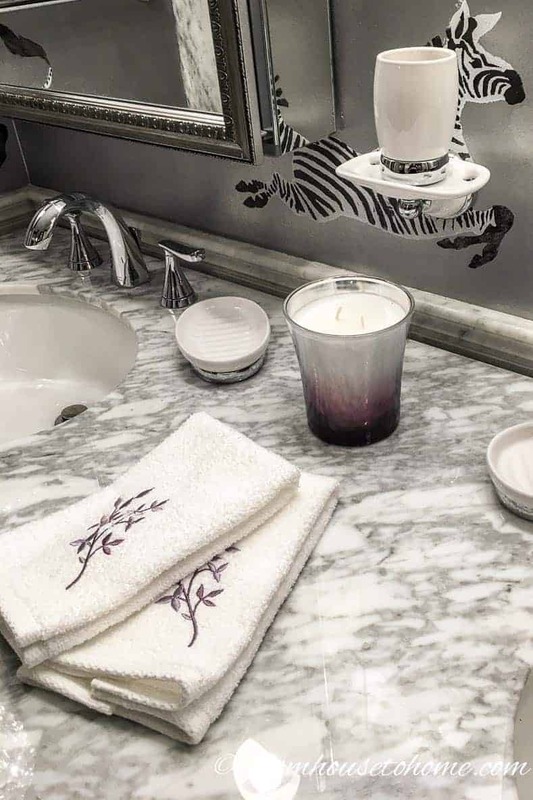 Have you ever tried to find a zebra stencil that is large enough to make a statement, has some character to it, and can be delivered in 2 days? It’s impossible! So I ended up making my own stencils (using an Adobe Stock image by Jeff Bird). Actually. And they turned out pretty well if I do say so myself. Note: All sources are at the bottom of the post. The new vanity has a marble top and under mount sinks, and is definitely an upgrade from the original builder-grade cabinet. 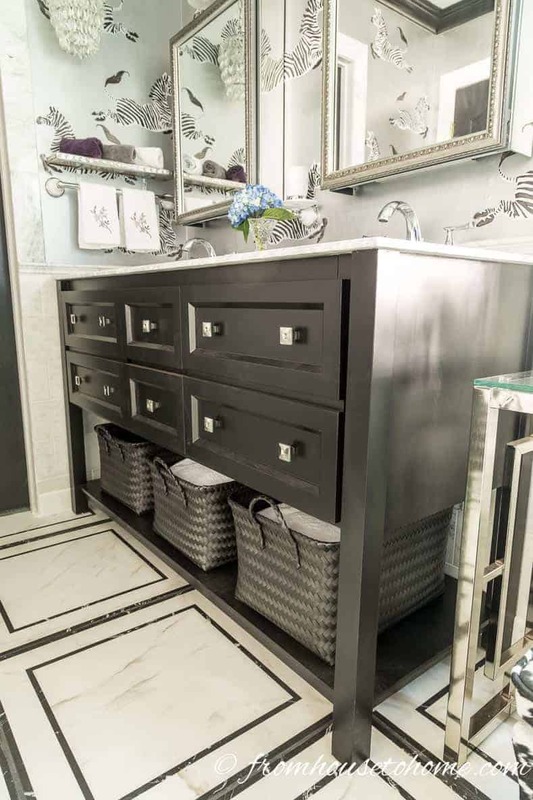 I bought large baskets that fit perfectly in the open space under the vanity, and they work well for storing towels. The little DIY sparkly silver shelf I made a while back is perfect for storing face cloths. 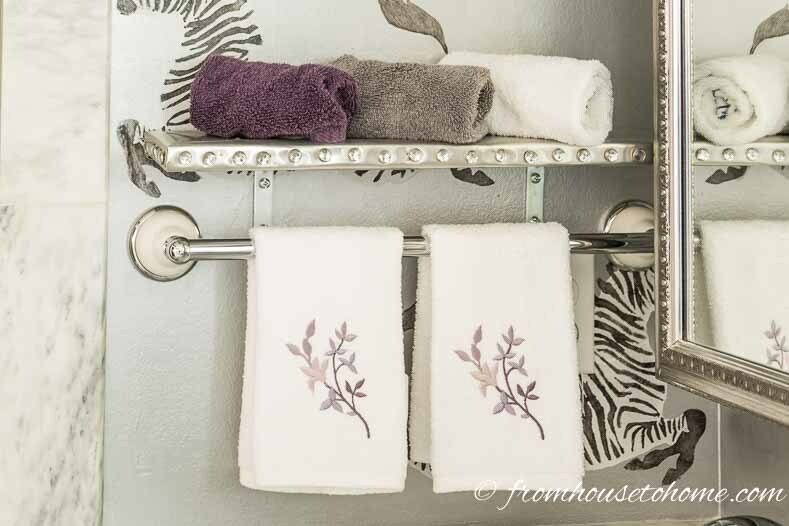 And I love the fingertip towels I found with the purple flowers…they help to tie in the colors from my master bedroom. 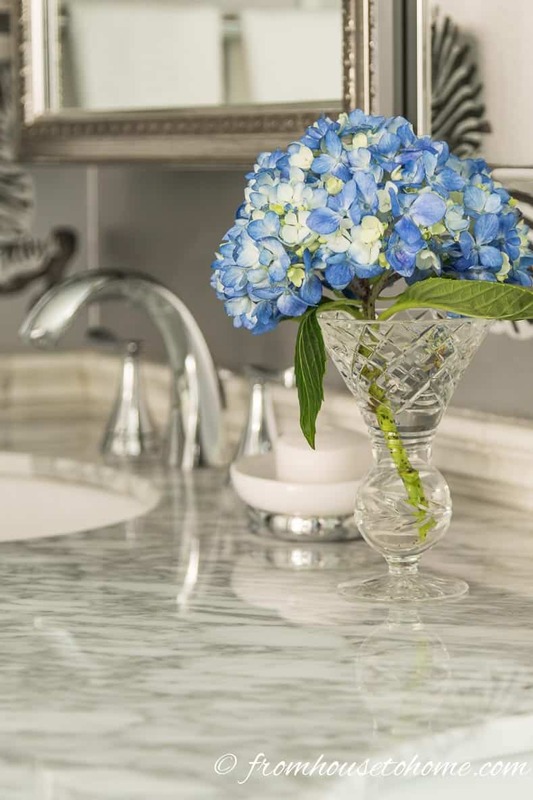 They also look great on the gray and white marble countertop. You also get a pretty good view of the zebras in this picture. At the other end of the room, my new freestanding bathtub fits perfectly in the space where the old built-in tub used to be. There isn’t any room to expand that space where the tub is (it’s actually an alcove under the stairs). So I had to get a tub that was less than 58″ wide. And I didn’t want to give up any sitting length or water depth in the tub itself. Finding a free standing tub that fit all those criteria was tricky! Since the tub doesn’t have a deck for things like soap and shampoo, I built a ledge against the wall. 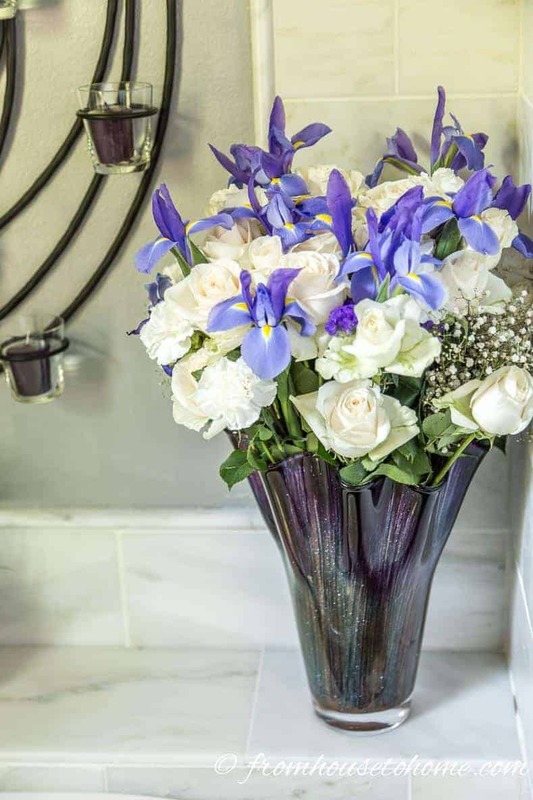 It’s also the right size for a big bouquet of flowers! The bench is also a good place to rest a tray with spa accessories if I really want to pamper myself. Speaking of the bench, I think this might be the most multi-functional piece of furniture I own. Besides being perfect for a tray, it’s a really comfortable place to sit, and it has a storage space…which I’ll be using as my laundry hamper. The console table fits perfectly under the window. And provides a space for my makeup mirror. You can also see my new roman shade which is cordless…and folds automatically when you put it up. This is the first time I’ve had one of these and I love it! How could I forget? There’s also the tile…I think the big floor tiles help to make the room feel bigger. And they coordinate very well with the marble wall tiles. Besides tearing out and installing tile, I also painted tile. These ones around the shower used to be blue…I used the same silver paint as I did on the walls to make them match with the rest of the bathroom. I hung my black and white fashion prints beside the tub alcove. Then added some candles and flowers (these ones are actually faux flowers). My purple vase holds a whole bunch of flowers! And I couldn’t resist this purple orchid. I’m not very good at keeping house plants alive so we’ll have to see how long it survives. 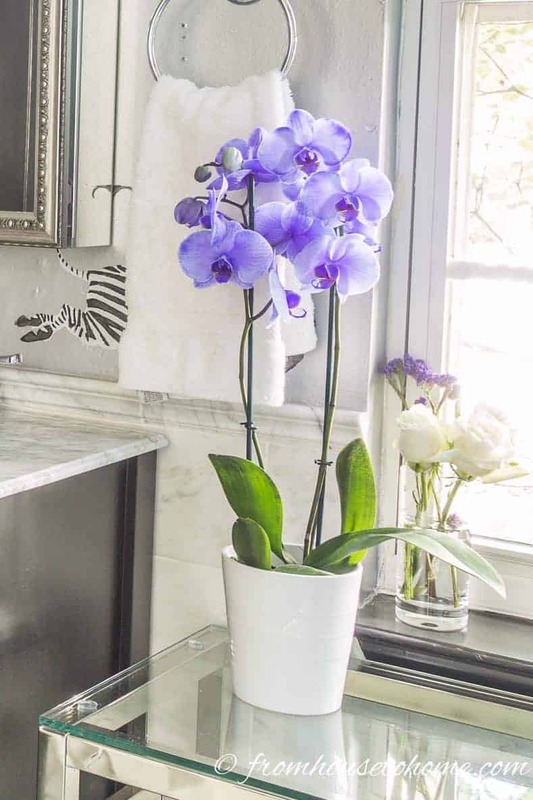 (My mother says they’re not hard to grow…you can see her tips on caring for orchids HERE). And if (or maybe I should say when?) 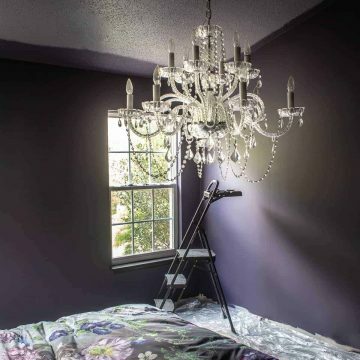 I change my mind on my master bedroom color scheme, it will be easy to update the bathroom. All of the tough-to-replace elements are neutral colors! So I mentioned very briefly at the beginning that I didn’t quite get everything done. So what’s left? You may have noticed that there aren’t any faucets on the tub. Those did not get installed in time for the pictures. Same with the new shower doors. They are still in the box. And I wasn’t able to find a place to fit in a pull-out ironing board (which was one of my wish list items). So for now, I put my over-the-door version in the closet. I guess I’ll have to make over my closet one of these days to find a good place for it. 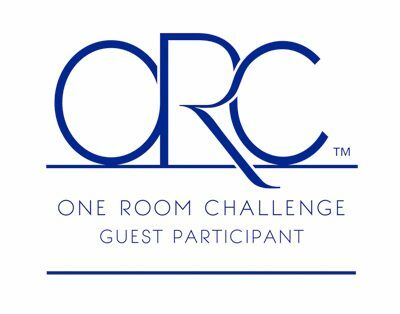 Don’t forget to go back and visit the room reveals of all the other talented designers in the One Room Challenge! 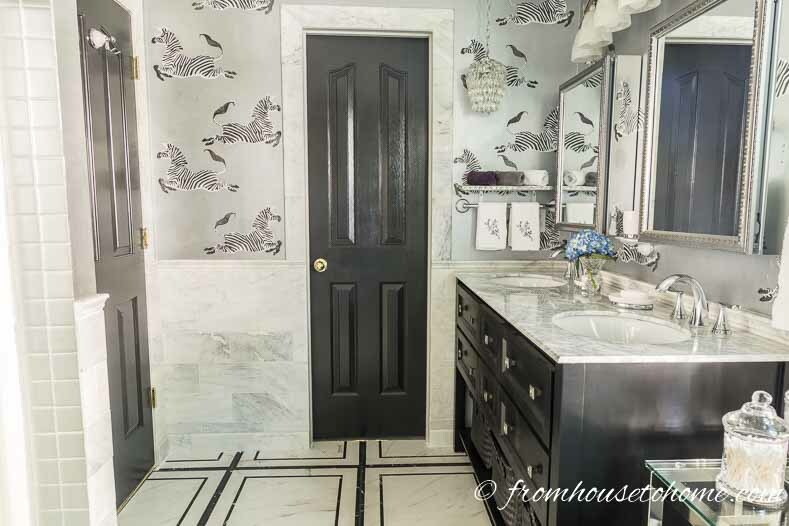 Have comments or questions on my eclectic, deco, glam master bathroom makeover? Tell me in the section below. 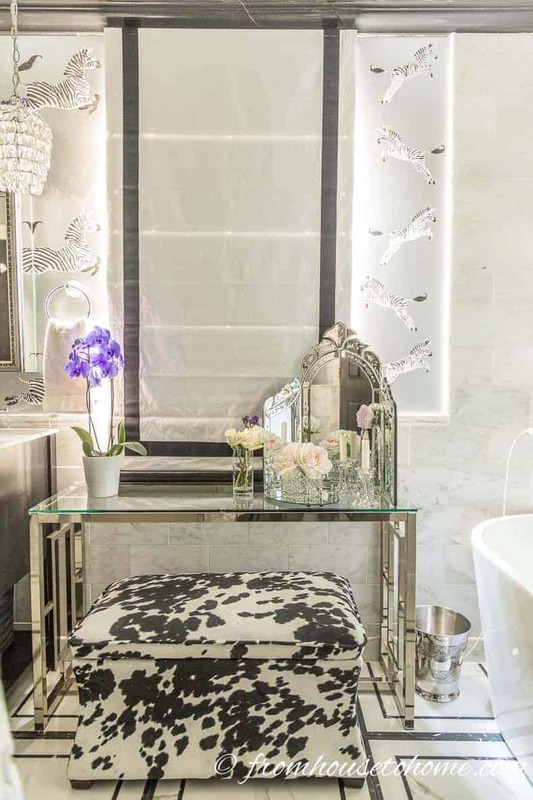 I featured your beautiful bathroom makeover on my blog! You did an incredible job..I have been keeping tabs on your progress ever since your Zebra wallpaper dilemma! You outdid yourself!!! My favorite thing about your room is it doesn’t look like everyone else’s! it is so refreshing to see someone with the confidence to do what they want and not follow the boring farmhouse herd. Bravo! I would feel like a superstar in this lovely room. Absolutely gorgeous! I always love your style and taste, Wanda! You’re fear fearless when it comes to tackling something that you may not have done before. I thought when you redid this BR it was super but now it is over the top! Luxurious, elegant and beautiful! Bravo! This is stunning! 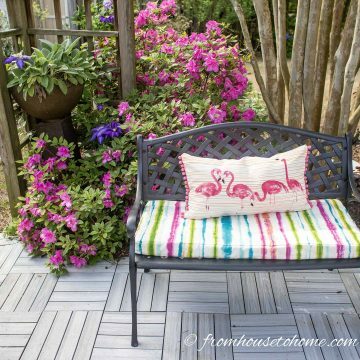 I had to see how that floor tile worked out, it’s pretty classy looking… But I am in awe of your stenciling job! How did you make it!? You did an amazing job on the whole room! Thanks, Eliesa! 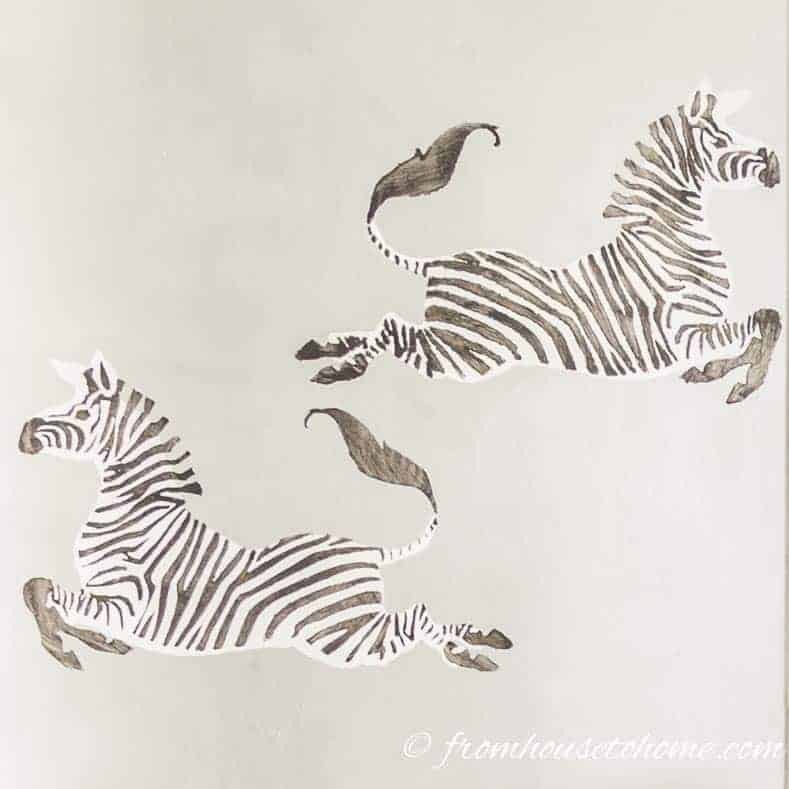 The stencil was kind of a last-minute addition 🙂 To create it, I got a zebra image from Adobe Stock, and then edited it in Photoshop to create 2 separate stencil images – one for the background white and the second one for the black stripes. Then used my die-cutting machine to cut out the images from a plastic sheet to create the stencils. It was a fun project! I’m planning on doing a post on it once I recover from this makeover :). 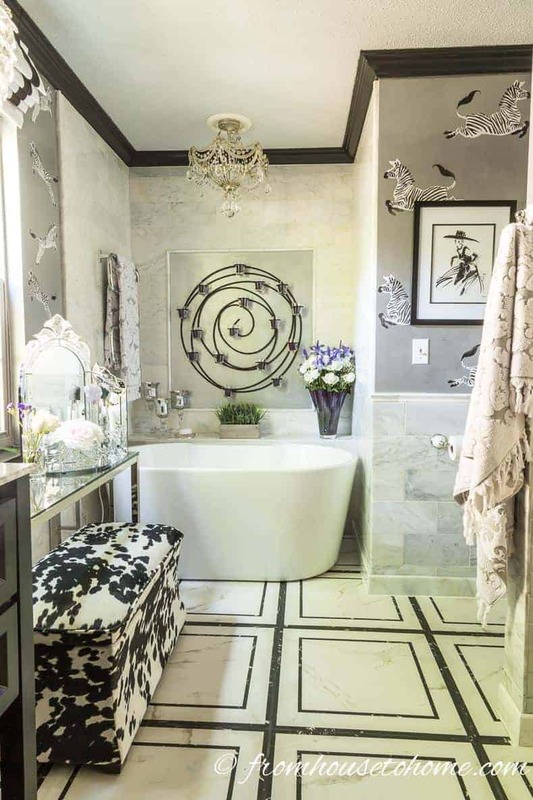 Wanda, the bathroom makeover is truly spectacular! I’m so impressed with all of the tiling that you did yourself. 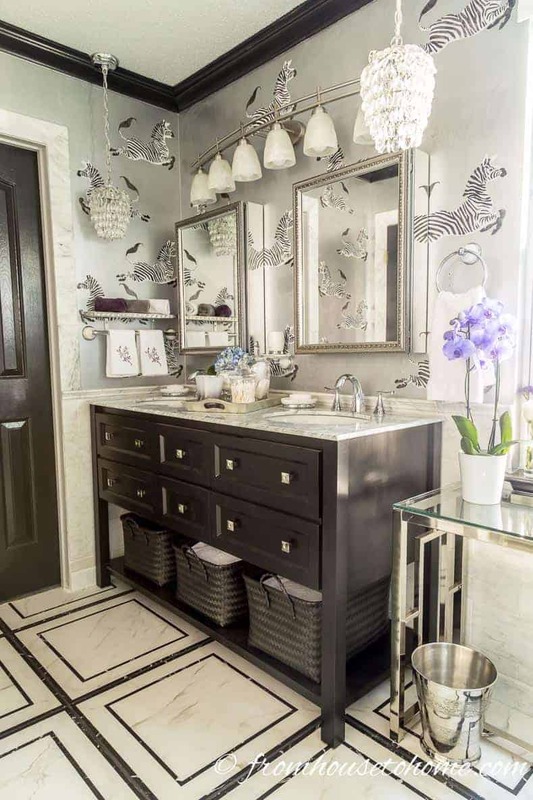 The floor tiles are timelessly elegant and the zebra stenciled walls are so pretty. Wow, what a stunning makeover. I love it all. 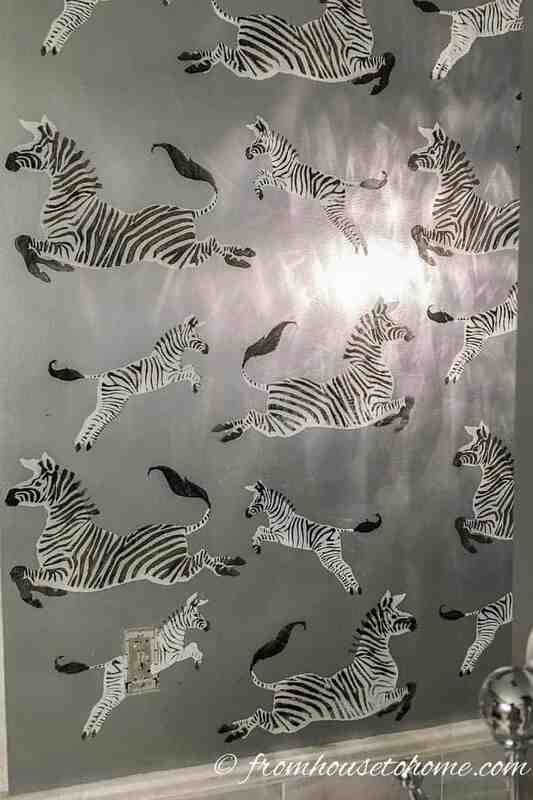 The floor is amazing and I adore the zebras on the wall too. Gorgeous. Amazing, amazing, amazing! What a great job. Love everything. Where did you get the table and the stand up mirror. They would be great in my bathroom. Can’t say enough good things. Thanks, Aunt Elaine! I’m happy with the way it turned out 🙂 The table came from overstock.com. 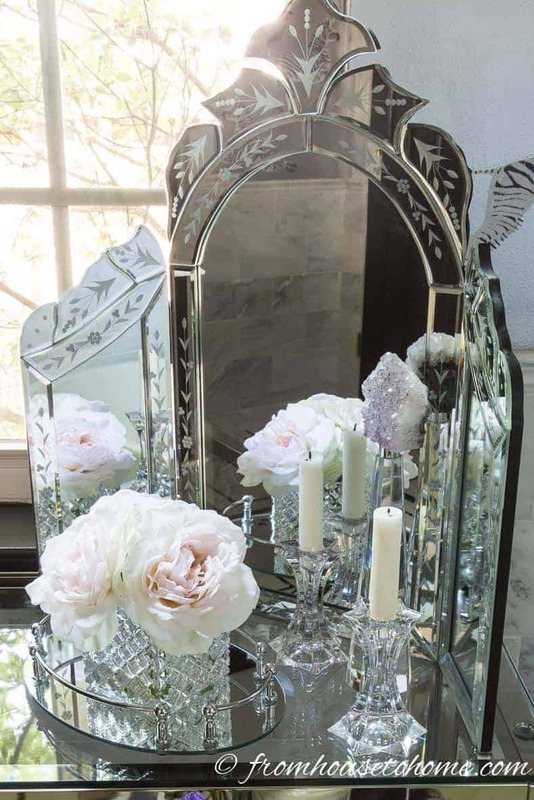 I got the mirror from amazon.com, but it looks like they don’t have this style in Canada. If you do a search for ‘tri-fold vanity mirror’, there’s a couple of other options that could work. 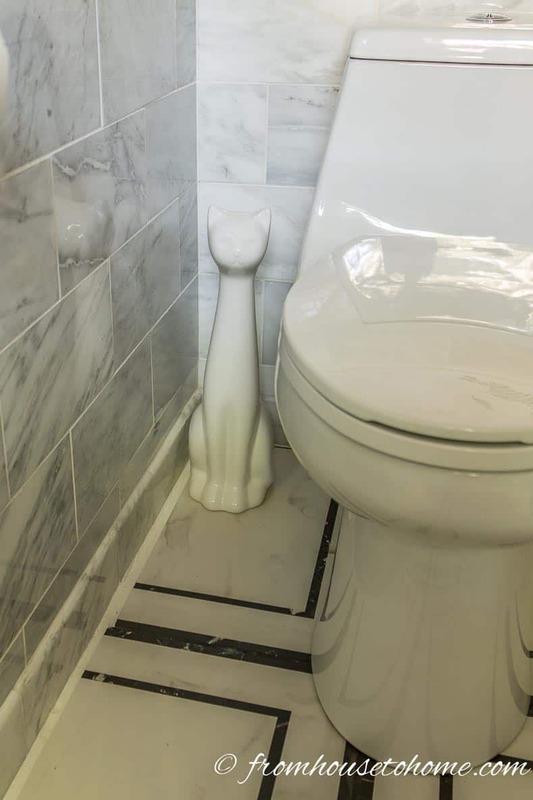 I only see one flaw with your new bathroom, and it’s a biggee! — It’s in YOUR house and not mine! 😉 Love it! AND, I like your stencil better than the original wall paper. Thanks for sharing the trip. It was, well, a trip 😉 And you have given me ideas for my bathroom. 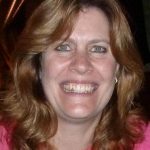 Thanks, Lenora! 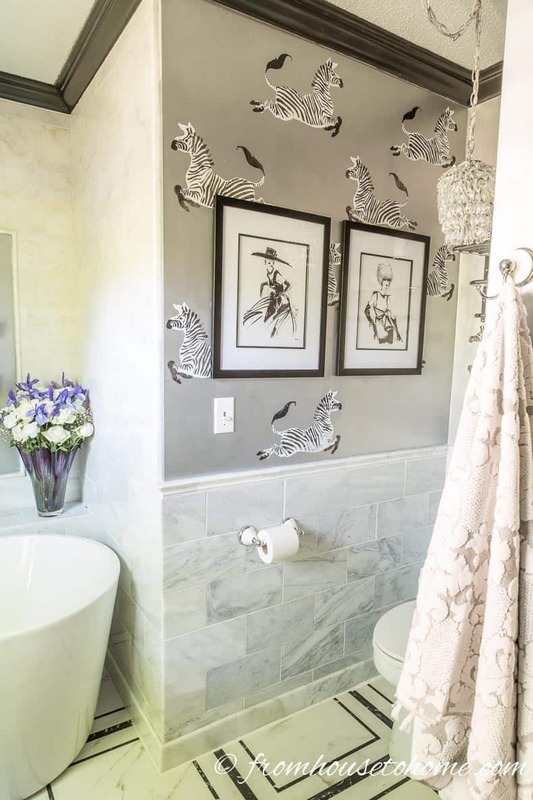 I actually like the way the stencil turned out, too…and it was a lot less expensive than the wallpaper 🙂 Thanks for stopping by, and good luck with your bathroom! what a fun space! love the flooring and that wallpaper is the best! 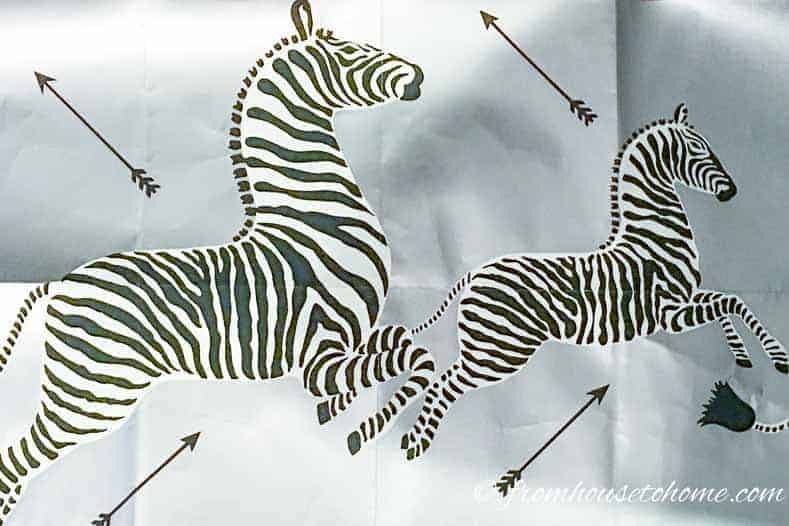 I can’t believe you created that zebra stencil. I totally thought it was wallpaper! 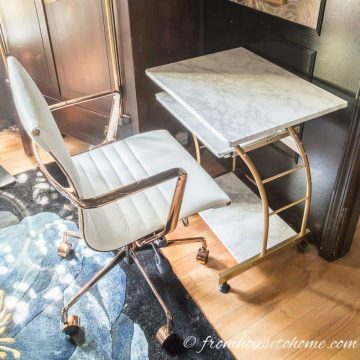 Your room is gorgeous, and I love the table and vanity. Beautiful job!